A lot of self-defense instructors believe that today's mean streets call for an arsenal of highly specialized martial arts skills and weapons designed to meet specific threats. Lee Morrison, author of the Urban Combatives videos and book available from Paladin, says that nothing could be further from the truth. As he points out, cavemen prevailed against predators of all kinds by using primal defense skills and improvised weapons, and so can you. 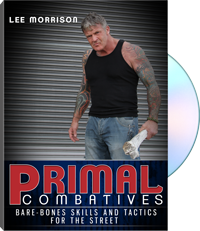 Derived from a curriculum for British military organizations associated with the Royal Air Force, Morrison's Primal Combatives program gives the average citizen, with limited or no training, a set of combative skills that will allow him to counter an attack and then escape as soon as possible. Based on overpowering the opponent through the use of weapons of opportunity, improvised tools, or nothing at all, Primal Combatives relies on very streamlined, bare-bones skills and techniques that require limited training and practice, and no prior combatives knowledge. Using the most caveman elements that can be found in nature – stone and wood – Morrison demonstrates how to turn these objects into sharp-edged or impact weapons of opportunity or tools to overpower an opponent before transitioning to a more powerful weapon, if available, or employing powerful unarmed skills and techniques to finish the fight. In addition to these natural elements, his curriculum includes the use of everyday items that can be legally carried and transformed into improvised weapons as needed. The focus of this video is on inflicting damage on the attacker before he has the opportunity to strike, and therefore taking away his will to continue. Morrison also includes less-forceful techniques for situations that don't require maximum force. Primal Combatives offers a good starting point for individuals who don't have the time, willingness, or previous training for a more advanced combatives curriculum. It teaches skills for those times – maybe once in a lifetime, maybe never – when you must unleash your primal inner animal to get home alive.